Generally speaking, mobile network operators (MNOs) were highly disruptive in the 90’s, but have continued to decrease in this over the last decade. Operators are no longer the offensive, attacking force of yesteryear, instead they’re putting up barriers and defensive walls trying to protect what they have and hide. Instead, the disruption comes from the open web. Whenever the operators put up a blocker to what users want, usually in the form of price or access to their infrastructure, the web finds a way of displacing them. Examples abound in location based services, text messaging, video and photos. There’s a reason operator revenue is shifting away from voice and SMS towards data. The products that got the operators here are receding in relative value. The user wants what’s available in the open web, and that’s just not found, or being provided, by the operators. So, what is an MNO to do? Change. Disrupt someone else. Innovate. One of the biggest disruptors, even in this decade of MNO mediocrity, has been Safaricom – the 800lbs gorilla in my own back yard. They’ve invested in new technology, products and business models like few others, and are reaping the rewards of those strategic moves. Do I like having a monopoly player in my market? No. Do I feel bad for the other MNOs (Orange, Airtel and Yu) who are crying now? No, they did this to themselves. Let’s dig into their golden-child, Mpesa, the mobile peer-to-peer payment system that’s did $3.15 billion in transaction in just the last 6 months(!). How do you know they succeeded in innovating? Well, the easy answer is looking at their profitability and user tie-in that they get from Mpesa. Look more closely and you’ll notice the other signal, all of the bank lobbies in other countries have put up huge walls, blockading an aberration like Mpesa from having sway in their country. The lack of leadership by Vodafone to NOT open up an API that other businesses could build on and increase usage. They’ve stifled innovation on their own product. Their lack of vision in the global payments space. Their shortsideness in not spinning out Mpesa as its own company to take on Visa and Mastercard directly. This was one of the few products and business models that could do that. Creativity in 3g data pricing and accessibility down market. First-movers in 3g and exceptional data coverage countrywide. 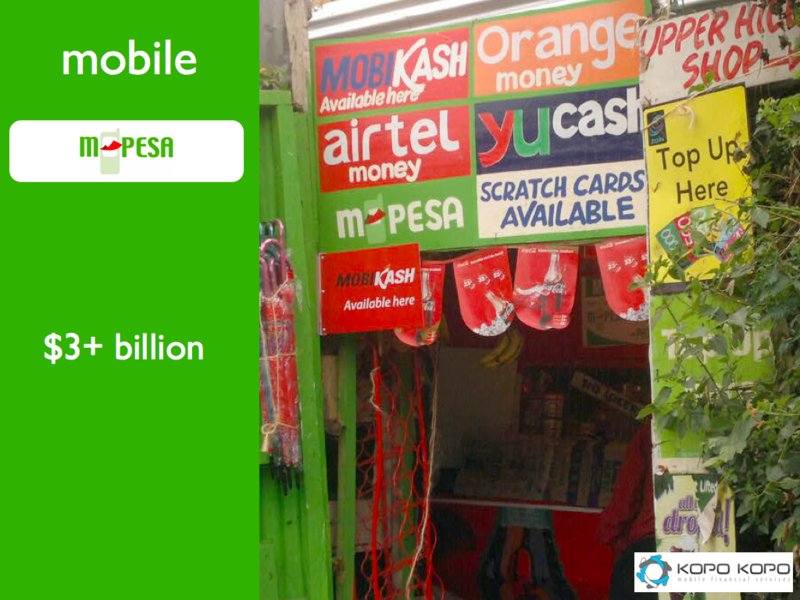 Okoa Jihazi, their product that gives a loan of credit from the operator to users who are tight on cash. 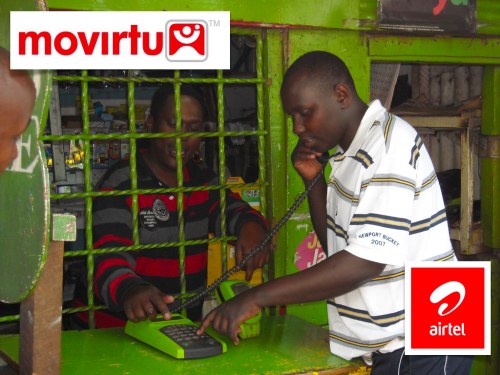 Airtel Madagascar working with Movirtu with their new Cloud Phone, a way for people to share a phone, but keep the SIM card in the cloud. 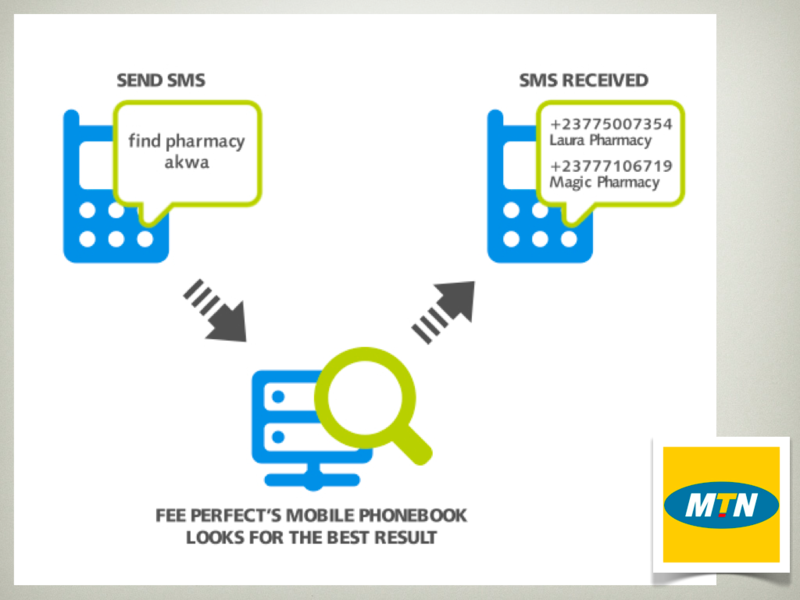 MTN, testing Mobile Phonebook by FeePerfect out of Cameroon, a product that puts a phone book into everyone’s phone. Clearly, innovative products can come to market through MNOs. What’s the common denominator on these products though? Most of them came from small companies and were then incorporated into the MNO. Ideas come from outside, they come from the edge. Scale comes from inside, from the massive infrastructure provided by the MNO. They have to work together to succeed. I work with, and talk to, hundreds of entrepreneurs. They have ideas, prototypes and products that just might be what the users want. They lack the access to the infrastructure to roll it out. As an MNO, you boost your chances of success in this increasingly chaotic space by not walling everything off, but by opening it up. I maintain that Russell Southwood and his Balancing Act newsletter and reports are some of the best material on pan-African technology and broadcast information that you can find anywhere. 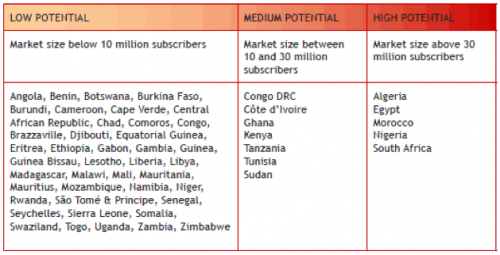 Their recent “Mobile apps for Africa: Strategies to make sense of free and paid apps” report is one of them, and here are some interesting tidbits from it. The report is broken into three parts: device, developers and distribution. South Africa, Egypt, Nigeria, Morocco, Ghana, Kenya and Tanzania all are good markets for apps, due to their population, 3g pickup and smartphone penetration. It should be noted that the highest smartphone penetration is in South Africa at 10%, though the high-potential countries are expected to grow by 8-10% per year over the next 3-5 years. 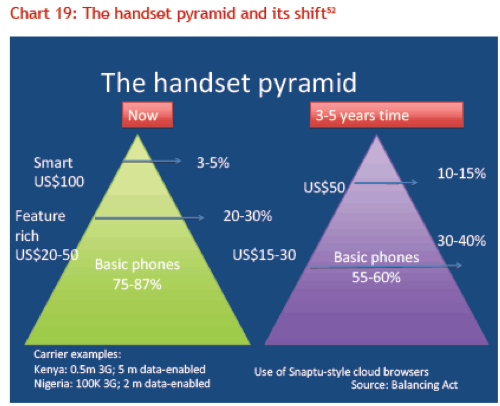 Balancing Act provides a very interesting visual of what the “Handset pyramid shift” looks like in Africa. The development of smartphone applications in particular commercial apps will depend on the rate and level of smartphone adoption. Developers in countries like South Africa, Kenya or Egypt with encouraging smartphone penetration rates have more opportunities in terms of apps development and uptake by potential users. The major international apps stores (Apple, Android, etc) have set a figure of 70% of the revenue generated by apps will be going to the developer. This is very good news for African developers because so far with SMS based content, the revenue sharing model is not in favour of developers since less than 30% of the revenue generated by the content is going to the author. It is African mobile operators that make the most out of them as they take a minimum of 50% of the revenue generated by SMS services. The major international apps stores also offer additional revenue to developers via advertising and in-apps purchases. These revenue streams are becoming more and more significant for developers. Building into the next section on distribution is the issue that developers have with creating apps for the international app stores. It’s very difficult, and often impossible, to sell apps on them and for African customers to buy them. So far, most African mobile operators have been little affected because smartphone penetration rates are very low in most African countries and also because African smartphone users still have access issues to the full portfolio of international apps stores. What smartphones do South Africans want? Benjamin Lyon started CreditSMS, a new outfit that is focused on providing an efficient an accessible platform for microfinance institutions to deliver and track loans via SMS. I’ve been tracking what they’ve been doing since they first popped on the radar two months ago. I’m intrigued by the question: can we decrease the cost for MFI’s with the use of simple SMS technology? This might very well be true, and I’m at least interested in seeing the experiment go forward. In the course of their research they needed to do more discovery on the possible ways to transfer funds with in Africa. This meant embarking on a study of the types of options available by every operator in every country. 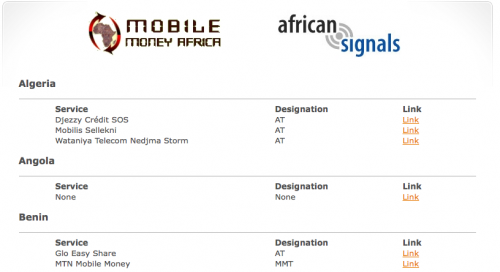 With that data, they decided to create the Mobile Money Transfer Directory. This first stage looks like its about creating a simple index of the operator, the money transfer service and a designation of the service. I can see this becoming more dynamic later, with data points like “transaction cost” and “number of merchants”, along with a slew of other pieces of information needed to understand the mobile money transfer systems (and how they differ) in each African country. Last month I had a surreal experience as I sat in the Global Messaging Congress in London, listening to mobile operators talk about mobile phone services from their perspective. It’s a crazy world really, one where the providers of the infrastructure also mercilessly try to hold onto and strangle every drop of profit from any service that sits on their network. We’re all born in a small “company town“, where the mobile operators are the landlord and the bank, the grocery store and the mafia. Interestingly enough, there is a completely different industry built on a much more open standard that separates infrastructure from content, transactions and use. That is, the internet. So, as we get closer to a world where there is less of a difference between the mobile and web worlds, then we see what happens when a strangling monopoly won’t give in to an open system. The open system bypasses it. It starts getting humorous when you start looking at value-added services like location, video or images. I sat there and listened to the mobile operators talk about how “MMS will never be the equivalent of SMS” – their cash cow. Of course, not with them running it. However, 2 days later we see this headline from YouTube, “just since last Friday, when the iPhone 3GS came out, uploads increased by 400% a day.” What? Yes, that’s a staggering number and it’s due to the fact that no operator is running it, they’re just selling the underlying data structure. Twitter is a great service that allows personal networks to form and SMS messaging to take place on an ever extending one-to-many and many-to-many basis. It also works on the web, in fact, that’s one of it’s great strengths – the ability to treat any channel as native. When I look at Twitter, which is 3 years old now, I have to wonder why we still don’t see a Twitter-clone offered up by any of the operators working in the 192 countries that Twitter isn’t in. For goodness sake, the only major cost for Twitter is the “to-many” part of it, and that’s virtually free to an operator on their own network. When the mobile operators of the world wanted to control their location services, in the early 2000s they kept their prices too high for large and small consumer-facing organizations to buy their services. So, the web went around them… The entrepreneurs saw an advantage to going out and getting the number off of every mobile phone tower and doing basic triangulation from them and WiFi signals. Voila, the operator is bypassed and now makes no revenue off of a service that it could have provided for a lower fee. This is a true statement (most of the time), so why are there millions clamoring for these other services and not the ones that the operators offer? The release of increasingly more user-friendly phones, coupled with services that bypass the traditional restrictions placed upon everyone by the operators, has created a way for the internet players to replicate or make irrelevant many of these same services offered by the operators. This will continue to be the pattern too, as the two industries collide. What the operators should do is open up their basic infrastructure for third-parties to build consumer-facing applications on. Take a smaller cut on each application or service, and create a true ecosystem that supports more developers and companies trying to figure out ways to make more money off of your framework.